As our overseas expeditions wind down, Australian soldiers, particularly those who have served in Afghanistan, will return home. Of those who served in Afghanistan, 226 have been wounded—that is, they have been serving in war-like conditions and hurt during contact with the enemy. Of these, many have permanent disabilities. I came across commando Private Damian Thomlinson’s story on CNN in relation to the US’ “Wounded Warriors” and Canada’s “Soldier On” programs. Injured by an IED in 2009, Private Thomlinson has both legs amputated. In an interview with 60 Minutes, he indicated he was willing to go back to work. However, when his former commanding officer, Colonel Paul Kenny, was asked about this possibility, he was non-committal. One area that remains difficult is where soldiers with disabilities or injuries wish to return to work and to their mates. For example, I read the story of Marine Staff Sergeant Dave Marino who, despite traumatic brain injury sustained in Iraq, fought his way to remain with his corps. It was an uphill battle. While we are doing away with various forms of discrimination—like gender restrictions in the Australian Defence Force and the Don’t Ask, Don’t Tell policy of the US military—it remains the case that employment in the military with a disability is challenging. In Australia, we have a system that has evolved from treating disability as medical and welfare issue to one that sees disability as the totality of social and environmental boundaries that compound impairment and one that protects and promotes rights of those with disabilities. Reading Defence’s policy on non-discrimination and equity, every opportunity is given for an individual to realise their contribution, however there needs to be a certain level of discrimination. For instance, fitness tests exist to ensure service members meet core requirements of military service. That said, the ADF is currently recalibrating the fitness test in recognition that, with better understanding and study, physical requirements change over time and in practice. In the same vein, could we recalibrate military requirements to be more inclusive? Our society has recognises that that people with disability have a right to exist and a right to equal opportunity. This is reflected by federal legislation such as the Disability Discrimination Act 1992. According to the Act, if a person with disability is the best person for the job and meets the “inherent requirements”, then employers may not discriminate on the grounds of disability. Employers are required to make reasonable workplace adjustments unless they can demonstrate it will cause “unjustifiable hardship”. As I see it, the legislation provides opportunity to revaluate both the inherent requirements of roles in the military and what unjustifiable hardship means. No doubt combat and the commensurate fitness will play an important part of the job requirements of the military. But will those requirements still be necessary, say in 20 years’ time? Given manning shortages in key capability areas like submarine crews, could the military provide further opportunity to those with disabilities and, at the same time, meet its strategic goals? The point is not to eliminate all discrimination as an end of itself, but to eliminate needless discrimination. Recalibrating requirements not in terms of specific disabilities but in terms of recruiting effective personnel, including people with disabilities, is part of that process. It seems that technology could help bridge the gap between the existence of rights for people with disability and realising those rights. Last week, it was revealed that paralysed rats had regained the ability to walk, even run and sprint, with a mixture of drugs and electrical stimulation. With human trials set to begin in two years, this could be an area that provides options for mobility impaired veterans. Last month, a paralysed woman was able to control a robotic arm using her thoughts, raising a cup of coffee to her lips. Another walked a marathon in a bionic suit. In years to come, with the further development of such technology, the concept of ‘unreasonable hardship’ on behalf of employers may be harder to demonstrate. These are but a handful of possibilities. Indeed, it could be worth convincing militaries of the benefit in investing in such technology. Turns out the robotic arm research is funded in part by the Defense Advanced Research Projects Agency. What about Lockheed Martin’s HULC exoskeleton? Many of Australia’s soldiers with severe injuries and disabilities come from commando units. In rational terms, the military would gain a better return on the investment in their elite training and better tap into the skills experienced soldiers offer. From the perspective of the soldier, there are more options to return to active work than discharging from the military or being tied to a desk. Yet these technological developments will only go so far in creating opportunities in the military. There will be certain mental conditions—intellectual disabilities or PSTD, for instance—that may prove more challenging for the defence forces. By focussing on rehabilitating and promoting those with physical disabilities, those with mental disabilities are left behind. For instance, the ability to predict susceptibility to developing PTSD could further unravel the effort to reduce stigma around mental health injuries. With better medical care and prosthetics, there have been soldiers with disabilities who have returned to active duty. These have largely been amputees. The inclusion of these veterans has, according to this Army Times article, been the product of evolving attitudes in the military. 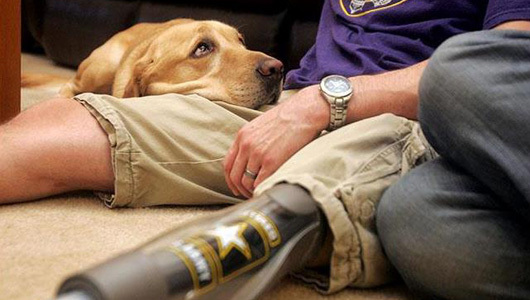 Soldiers with disabilities, with their experience and training, are seen as valuable members. That said, they are often transitioned into desk-bound roles in counselling and training. Only few have been allowed to return to war zones. In early 2011, Skelton was deployed to southern Afghanistan. There were challenges with some of his Iraq injuries, but he carried out his job of leading soldiers, training the ANA and liaising with the local community. Specialist Hilson’s comments make me wonder how far the US Army has actually evolved towards people with disabilities. It’s not just institutional policies keeping these soldiers on the outside, it’s also attitudes. Until recently, the ADF prevented women from doing certain jobs on the military based on their gender. And attitudes about women in the military will change. Maybe it’s time to start thinking about how this applies to disability. While Captain Skelton’s case is an exception rather than rule, it demonstrates that leadership and ability don’t have to reside in convention. There are challenges ahead for militaries around the world, and until they are tackled, there are wounded warriors left on the outside and those still dreaming to get in. Image courtesy of Mother Nature Network. I am grateful to Alex Horton, New Media Specialist at the US’ Department of Veteran Affairs, for this point and link. This entry was posted in ADF, Afghanistan, Disability, Dogs, PTSD by Natalie Sambhi. Bookmark the permalink. Thank you very much for this moving, but non-sentimental call for well-deserved attention. You raise a valid point, and on that the military (all militaries) must consider, that with all the training and experience that soldier with one hand may have, not putting them back on the line in some capacity is categorically stupid. Which, given the usual bureaucratic nonsense that populates any government endeavor, is probably exactly what will happen.